I'm thinking of upgrading art boots for myself and my wife. We currently have Riedell 220 boots. They fit well and skate well. However, I want a little more support. But just a little. We are session skaters but do work on jumps and spins on occasion. What is the current thinking on best value brand and model for freestyle boots. I don't have a budget yet, but I am familiar with the cost of boots, so I'm not going to be shocked. We have some good rinks around who will work with us, but I want to get multiple opinions before approaching the rink. Riedell and Edea would probably be your best option. Harlick and SP Teri are getting into the higher end. I'd actually look at the mid-range Edea boots; Ritmo or Rondo. Not as familiar with the current Riedell models, but if you like what you have then you probably wouldn't go wrong with a stiffer model. Great question, here's my long response...lol! Wow what a wonderful subject. I’m surprised more people have not imputed, with their opinions or suggestions. Come on guys are we shy…lol! Don’t be afraid to ask Doc. He says he has mounted up many art skates so he probably knows what you need or has mounted it up already. I’m presently skating on 4 pairs of skates, so my opinion is a little bit biased and may not be the right skate or boot for you????? But you asked about Riedell boots specifically! From what I found out recently talking to the manager of our skating Rink only 3 pairs or Riedell Figure skating boots can be bought at your local skating Rink. They are the Riedell, 220, 297 and I think Rick called it the 330. All other Riedell figure skating boots and there are tons can only be bought at a Ice Skating Rink. Most other Riedell Figure boots are sold through authorized ice skating rinks. The Riedell 220, 297 and 330(?) 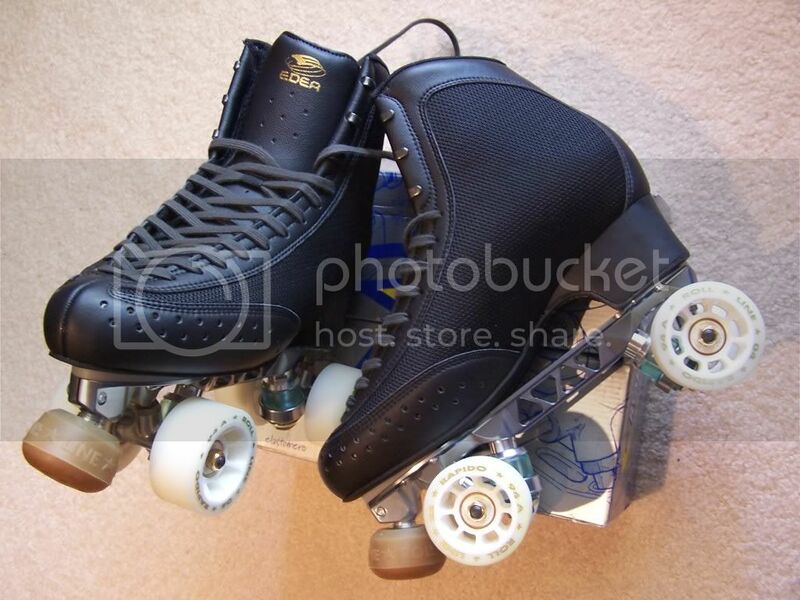 are considered roller skating boots and only sold at Authorized roller skating rinks. Also be aware, I have many pairs of Edea figure skating boots. Some Edea figure skating boots are made for Roller Skating specifically. Many are made for Ice Skating in which people adapt/put on their Roller Skating plates. So yeah there are boots made specifically for Roller Skating by EDEA. I have both. In general the EDEA Roller skating boots are not as stiff…around 40-50 in stiffness and EDEA Figure Skating boots in the same model for ice will be about 70-85 in stiffness. Get the picture???? I think the Ridell 220 boot is your basic “Art” skating boot sold to most new skaters until they figure out what they really want to do in skating…lol! And I don’t think it’s really that cheap. My friend has a pair 45 years old and he still skates on them today. He took them to a shoe shop and they made them like brand new. A beautiful pair of boots. At our rink and it is a American Dance Roller Skating rink and they push the Riedell 297. It’s not cheap. I think its around 450 dollars. That is quite a bit of money. Even Rick’s son skated on the 297 for freestyle and I think he did triple turn jumps and was a world class competitor. So the 297 is a good Freestyle (jumps and spins) boot or American Dance boot. For Dance one lady chopped down the 297 boot height for Dance and bought a another pair, untouched for Freestyle. Just left the 297 in the tall boot configuration for Freestyle. A third lady bought the Reidell 330 boot. That is a really nice boot. It’s suppose to be better boot than the 297 and it looks it. But it has been chopped down, not as tall aready, which make me think this is really a Dance Boot. It’s got all kinds of nice patting inside the boot and I think it has fur on the tongue. Nice pair of boots but I question if I would jump in these boots. For the casual skater like yourself, maybe it would work fines for jumps and spins. I only have a couple of boots for Freestyle. One pair in the garage and the only pair of boots I ever skated on. Riedell Gold Star/375 which you can only buy in a Ice skating rink. They are 45 years old mounted on Synder Imperial Skates. I could never skate on them today. I bought another pair of Donald Jackosn Boots and mounted them on another pair of Synder Imperial Skates and they are just too stiff for an old man like me. You can do freestyle in them but not dance…lol! Just for the record I have one pair of freestyle skates mounted up. Roll line Energy with EDEA Ice Concerto boots. Nice setup, which I recommend. Two pairs of Dance skates (160 and 170). Roll Line Dance Plates one with an Ice Fly boots and one with a EDEA Roller Flamenco Boot. The longer plate 170 has soft cushions, brown with the EDEA Roller Flamenco Dance Boots, with Bones Ceramic Bearings and Bones Wheels 101A. Those are a beautiful pair of skates. A dream to skate on if you like American Dance…lol! My last pair of skates is a Roll Line Ring Plate, with a EDEA Roller Flamenco Dance Boot, with Bones Ceramic Bearings and Bones Super Elite 103A Wheels. I use this skate for Dance and Figures. It’s really not ideal for figures but works for me because I only do simple figure…Vetereans for people over 55 and works Ok for Dances with medium size lobes like the Luna Blues. Skates I have not mounted up yet. Synder Royal with Edea Concerto boot and Roll Line Matrix plate with a Ice Fly boots. I bought a pair of the best boots, EDEA Piano and was wondering if I really wanted to try out the Roll Line EVOL plate. Anybody skate on a “EVOL” plate? Larry your right he skated on the 297 but it doesnt have much support, in roller u dont need the same support an ice skater needs because of the 4 wheels as opposed to an 1/8 inch ice blade. he went to the 330 just before retiring but never competed in it. the 320 we also had is the new silver star and is quite supportive more like the old royal boot i think which was for figures. might be good for them to go to an ice rink and try on the boots as they have more variety and probably have a bunch of used boots they can try on and even buy. also the 336 might have more support then the 220. I started out on a Reidell 220. (I'm a former skater that decided that 27 years later was not too late to start skating again!). I did everything on the 220 (dance and freestyle). It had started to break down after almost 3 years of use. I chose to go with two pairs of skates to replace my one. (One for dance and one for freestyle). I am using the 297 boot for both. It is stiffer than the 220 but not as stiff as the 336. I had the dance boot cut down so movement is easier. I left the freestyle boot stock. (I do single jumps, spins (sit, attempt a camel). I really like both boots for both disciplines. I do not have any experience with any other boots so my opinion is biased. They both give me the support I need without being too stiff. The break in period wasn't too bad. Just my opinion! Let me know if you have any questions! I started on the 220 and did all my competitions in that boot. It was a good boot. After I stopped and then came back my 220's were too dry rotted so I bought some gold stars. HUGE MISTAKE. Way to stiff especially for starting over. My wife tossed my skates after my last fall and concussion. I guess 2 concussions and a compound fracture of my arm was just too much for her. I almost divorced her for it. Just over 1.5K worth of skates and parts. I am now retired and am losing weight again. My wife is really strict on what I eat now so I am slowly losing the weight. What she doesn't know is when I get down to about 200 lbs, I am buying a new pair of skates. I will go back to the Super Deluxe plates and get a pair of 297 professionals. I will be buying them from Connies Skate Place and have them mount them. On my new food restrictions I am off my blood pressure meds and my diabetes medication and I have enough slack that on my diet relax days I can still have a soda or a beer or a few shots and some other sweet. Within 3 days my blood sugar is back down to normal. As much as I don't like my wife hovering over me for my diet, she is doing me well. I do want to wait till my weight is down so I don't injure myself again and so my skates are perfectly fitted. Heck! If I can do a single mapes at over 300 pounds then I should be in very good shape at 200 lbs. Yep! a 297 for me. In 1989 I started with the least expensive leather Reidell boot. I don't remember the style#. Those were fine until I made the mistake of being attracted to a practically new pair of Reidell Royals. Huge mistake. They were so stiff I felt like a penguin. What to do, what to do? The rink manager who sold me the Royals, ended up selling me a pair of 297B, professionals. I don't know what the 'B" indicates. Wow, it was love at first skate, and I wore those for almost twenty years, skating several hours a week. Thank God, I've hung onto them, and the Sure-Grip Classic plates they're on. The Reidell 336, aka Tribute, boots I bought to replace the 297, has never felt nearly as good as the 297's mounted on the Classics. Even after six years of use. From the beginning, they reminded me of hiking boots. So, my rink has been closed for 3 years, and I must travel 200 miles round trip to skate for two hours, and I'm so tired of it. 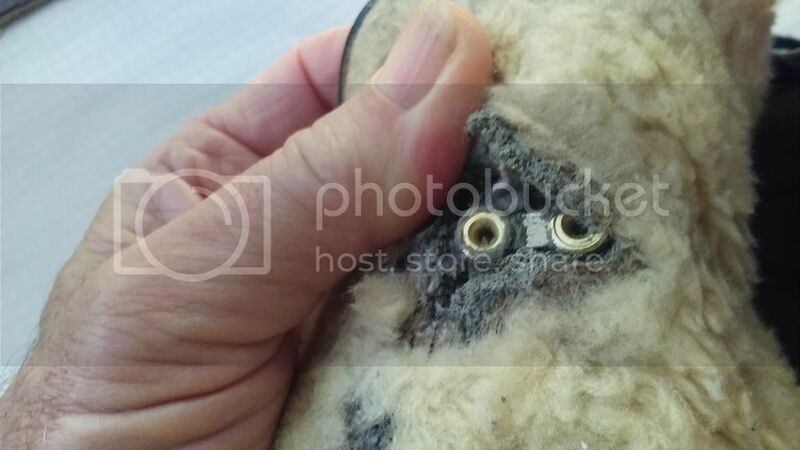 If it so happens my local YMCA should buy the dead rink, I am going to have my 297's repaired: new shearling in the tongues, repair areas where the eyelets pulled out, install flex notches, and maybe ventilation holes. What the heck, if possible, I'd love to have cork integrated into the heel, even a cork sole. It is true, the Tribute boots are much lighter than the 297's, but I don't think it's a big deal unless one is concerned with it. I am hoping and praying for the rink to be resurrected, and I can try my rebuilt 297's mounted on the Mistrals. Maybe I'll mount the Tribute boots on the Reidell classics, for outdoor use, or whatever. If I had it to do over again, six years ago I would have taken a break from skating long enough to have had the 297s rebuilt. love these boots, especially the active cooling holes. Edea run narrow, do not order with wide feet. also the heel is extremely high, i cut 3/8" off the heel height. after that they were perfect. Buy the skates now and use them as part (or most) of your weight loss program. Why not? Too heavy. Too many emergency trips due to my weight. I will do this when I can do it safely and I am able to handle a fall. Here's the thing with diets, there is no such thing as a "relax day." If you start a "diet" thinking it is a temporary thing you have already lost. It's a lifestyle. You either live/eat/exercise a healthy lifestyle or you don't. If you want to drop the weight fast there is no mystery or magic as-yet undiscovered secret. To lose weight you eat healthy and do exercise. Everything you think you know about sugar is wrong. Sugar lights up the same region of your brain as cocaine. Avoid sugar like you would avoid any drug. No more alcohol. It's empty calories and metabolizes straight to fat. You need to get where you can do an hour straight with your heart rate in the appropriate zone. If you're retired you are even luckier than most people! You can do two-a-days! But, with anything like this, you need to clear it with the doctor before you start pushing your heart rate up. Cut out red meat, sugar, ANYTHING processed, salad dressings, salt, fats and breads. Chicken, fish and vegetables are your diet. Olive oil is your friend. Get your heart healthy and the rest falls into place. 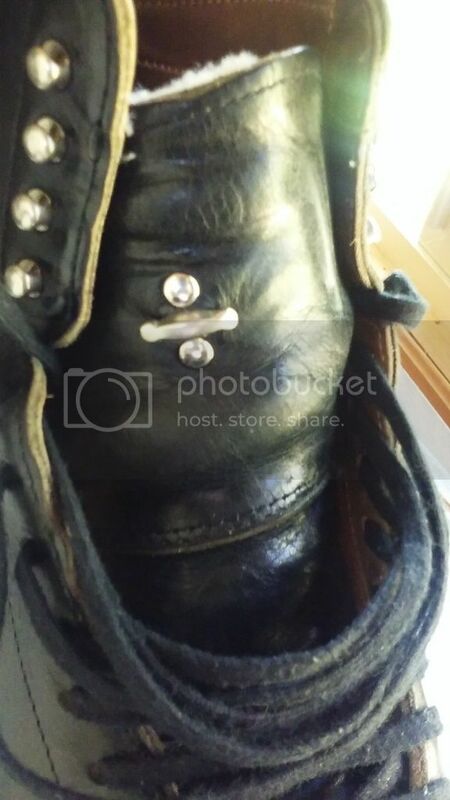 Does anybody know something about Risport boots? The few online skate shops in my area seem to sell only Edea and Risport boots. I like the "pro mount tech" of the new Risport boors. I'd like to start artistic skating, and need to choose between Edea and Risport. I skate inlines since years. Thanks for in input guys. The Edea Fly look great. But I have a normal width foot so I'm worried it might be too tight. If I were to set my sights higher, which would be better: Terri or Harlick? Could you please tell me why? Thank you. I never liked the higher heel and its construction as it was hollow, not sure about now and the outside wasnt leather it was a vinyl. also they ran narrow. i know people that liked them but i didnt, they were lighter weight also. I found a lady with the most expertise in Houston. Her primary business is ice skates of course. I was there for almost 2 hours. We placed a call to Riedell since she was not familiar with roller skates. I ended up ordering the Riedell Model 336. She had concern with the Edea since I am older and the heel is higher on the Edea. She said with the Edea there is more risk that I won't like the boot. Since the 220 is working for me she recommended sticking with Riedell. She also said when she moves skaters to the Edea she shortens the blade by about 1/2". The raised heel decreases the boot length. I assume the same is true for roller skaters and the use a smaller plate length.